Remember, diamonds are only lumps of coal that stuck to their jobs…. It is certainly safe to say that today’s beer wholesaler is not your father’s beer wholesaler! Long removed from the wholesale model is the small mom and pop middle tier representing one brewery and one, maybe two brands. If mom and pop planned it correctly, and had a little luck, they are now living large in Palm Springs. Just like the breweries, these little mom and pop operations consolidated over the years. First, consolidating within their own footprint, which was usually their local town but continued brewery consolidations, along with the industry pundits and consultants who advocated driving costs out of the system, wholesalers continued to consolidate. Wholesalers went from local, to regional, to statewide, and in many cases today, multi-state. Volume wise, these multi-state operations are huge and are selling tens of millions of dollars in cases of beer. Just 25 years ago while heading up Coast Distributors, we were ranked in the top 10 volume beer companies, selling only 5.2 million cases. A total that today might be considered an average size at best and even small by some! Times have changed! Given the upcoming acquisition of SABMiller by ABI, the question now becomes just what will the US beer wholesalers look like in the coming years? Even today we have essentially two mega wholesalers per market: the AB house and the MillerCoors house. The larger the market, the better the chance there will be other wholesalers such as wine and spirit houses. Or perhaps the development of an extension of a large mega house with some small crafts and imports and/or some craft/import specialty houses will develop. This is, of course, not counting any craft breweries that are self-distributing. Even prior to the upcoming merger, one can make a case that there really were no AB or MC houses. Many MC houses have brands owned by ABI including Stella, Becks, and Bass, not to mention the Modelo products. You can say the same about the AB houses too, Anchor houses, notwithstanding. Already there is some discussion as to what to call the new ABI/SABMiller Company even when the AB name is dropped. This is simply incredible when one thinks that this just might happen. As the sales shift continues in the US to more imports and crafts, ABI is growing by acquiring other companies and wholesalers are growing by adding crafts or buying other wholesalers or brands. If ABI feels the need to change their name to reflect the new company, perhaps wholesalers who are AB should consider dropping any name referencing AB, including Eagle Beers or Brands. Wholesalers could be moving to Beverage or just House of Beers. As ABI evolves, so do their wholesalers. What is good for ABI and MC is good for all wholesalers. Remember, diamonds are only lumps of coal who stuck to their jobs! I have no idea what’s next. I simply don’t have a clue. In 1970, when Philip Morris bought Miller Brewing Co. neither those within the beer industry or outside the industry, had any clue just what PM would do with the newly acquired company. Phillip Morris put their marketing muscle, which had been so successful in the cigarette industry, into the brewery and the rest is history. Then when Stroh Brewing bought the Schlitz Brewing Company no one knew what would be the outcome, but many were hopeful that Stroh could turn sales around. Ditto with the G. Heileman Brewing Co. when Allan Bond from Australia bought Heileman. Moving forward to 2008, InBev bought AB, and once again, no one knew just what InBev had planned for AB. While many thought they knew, the reality was the future was simply just speculation. Each of these transactions, in one way or another, dependent upon your view, materially changed the beer industry forever. The impact was felt, not only in the US, but throughout many parts of the world’s beer business. Many recent transactions include: ABInBev buying Modelo, and, of course, Heineken and Femsa to name some other large dealings. Each of these business transactions contributed to the just announced sell out of SABMiller to ABInBev. 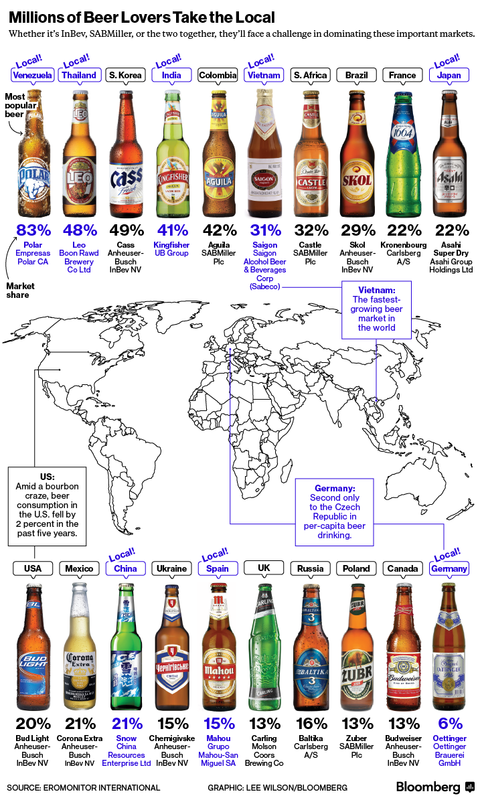 Once the SAB Miller/ABInBev deal is finalized, which will probably be early 2017, ABI will represent approximately 35% of the world’s beer volume. So just what will happen next? Once again, no one can forecast exactly what will happen to either ABInBev or any other brewery or brand as this historical purchase unfolds. Rest assured, there will be plenty of industry pundits weighing in on the deal and giving us their opinion. What is known is the historical past. What is known is how ABInBev approaches acquisitions. In every buyout, people were laid off, offices were closed and/or gutted, operations streamlined, prices raised, advertising cut, changed or modified significantly, and all resulting in volume losses and eroding market share. Shareholders were enriched, margins enhanced, costs reduced and the bottom line was increased. And Wall Street would sing praises as stock rose. Finally, the lending institutions will be pleased as their loans will be paid in full. SABMiller as a company can expect all of this to happen to them as soon as the ink dries. People will be laid off, costs will be reduced, prices will rise worldwide, volume will drop, but ROI will grow and debt will be quickly reduced. This will happen. Consider the countries where ABI will have 98% of the beer volume. Why would they do anything outside of their business model? The US and China will be the two countries to watch. Will the companies such as MolsonCoors, who stand to gain the most from this, change their business model and begin to once again chase market share? The same in China with the Snow brand. Where will it go? We know what ABInBev will do, they will not change, not now, not ever, as long as Brito is there. In fact, expect them to aggressively pursue a larger role in the US three tier system, controlling as much distribution and margins as is legally possible. Craft breweries stand to gain much in the short term, if, and that is a big “if,” they have access to market. Crafts focus should be to grow their category as fast as they can, as soon as they can. The industry, once again, will change and shift. I have no idea what will happen next. I simply do not have a clue. One day, during my first summer on a Coors beer route, we were finishing our work with a liquor store in downtown Dallas. I stood by a stack of Miller High Life, with the salesman writing the delivery bill, when the store owner looked my way and commented on the Miller. He said that that Miller was a hidden gem, and that if someone had the money to invest in it, the beer would be a major brand. As history has shown, this is exactly what happened when Philip Morris bought Miller Brewing in what might be the first of multiple occasions when a brewery was bought or merged with others. Every week the industry announces another craft brewery selling or taking on an investor. This is, of course, happening in the shadow of the ABI/SABMiller deal. When Scott Whitley, a longtime employee of MillerCoors and currently the CEO of Tenth and Blake headed the brewery’s Denver distributorship, he commented on what he looked for in potential new brands. Scott believed that new brands must have a face, a place, and a story. Brands with these three key points, assuming one is dealing with a quality brand, would be successful. The activity from PE firms on interest in crafts have increased dramatically in recent months. In conversations with these firms, the number one question is just how big will the craft segment grow? That is a difficult question to answer for anyone. Using Oregon and Washington as templates, however, crafts have the potential of being as much as 50% of the US market. The next question should always be: what does it take to be successful? Which is answered by the same comment made by Scott: a face, a place and a story. Quality included. Once those key drivers are explained, the PE firms understand what this means. In some ways, it is ironic that the successful crafts combine all three of these drivers. When talking to a PE firm, they start with the comment that they only invest in firms within their qualifiers. For example, the PE firm might be interested only in breweries within $5 to $15 million in revenues. When you look at any successful craft, you see that all of these components do exist. To name a few: Jim Koch-Boston Beers; Kim Jordan- New Belgium; Larry Bell-Bells Brewery; Tony Magee- Lagunitas; and Meg Gill-Golden Road. A place is self-explanatory, and when you look at these companies they all have one. And, of course, there are many compelling stories upon which to base marketing. Today’s start-up crafts need to incorporate all three key points if they plan on being successful to any degree. Those that do not, will not survive, or will not stand out in the massive clutter of brands in today’s market. Investors and PE companies should follow the beer wholesalers’ lead when they take a serious look at a particular craft brewery. Successful beer companies all have the same core: a face, a place and a story. 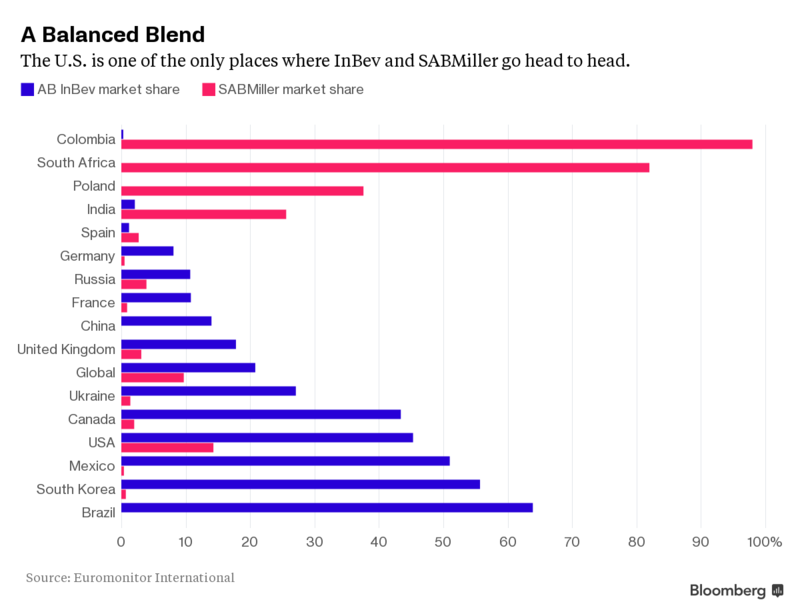 As expected, ABInBev has done the homework necessary to buy SABMiller. The old truism has again comes to light: everything is for sale if the price is right. Majority owners of SABMiller, including Altria, stand to substantially benefit by selling to ABI, just as the shareholders of AB profited in 2008 when purchased by InBev. Because of this purchase price, the deal will go through, and the interesting part is yet to come. The complexity of this deal, soft drink bottlers notwithstanding, could present some very attractive opportunities for other beer companies. Those who will take advantage of such situations, have positioned themselves as alternatives to just such a set of circumstances. When AB was bought out, NAB was enhanced by the acquisition of Labatt’s from InBev to ensure justice department approval. It is common knowledge that when ABInBev bought Modelo, Constellation ended up owning not only Modelo in the US, but also a world class brewery in Mexico. The ongoing results were dramatic for Constellation. Given the number of recent, and I mean recent, changes in ownership of craft breweries across the nation, one needs a scorecard to keep the multiple transactions straight. Could any of these play out in the possible anti-trust fallout from the ABI-SABMiller deal? Constellation Brands’ senior management and their commitment allowed the company to first take advantage of acquiring Gambrinus’ territory for Modelo. Based on that commitment, when ABI bought Modelo, Constellation acquired Modelo for the U.S. Now they own Modelo and a Modelo brewery. Constellation could be one of the players in this possible diversification of brands from ABI/SABMiller deal. Whereas other potential players will miss the boat based on past decisions which put them in an unfavorable position to take advantage of the situation. For example, Carlsberg, which pulled out of the US as a player some years ago, would have been one with the resources and size to purchase some of these brands. Not now. There are others who did the same. Outside of Constellation, perhaps NAB will once again take the plunge. They could be a player but the real question might be, will others like Boston Beers take action? What about a Sierra Nevada? Any crafts or importers with the resources and national distribution could pick up one or several of the smaller, but unique brands that might be sold off by ABI or MillerCoors. The one unknown is how Heineken will position itself as all of this unfolds. At first glance, one expects little to nothing in Heineken for them to act. Rest assured, however, they are analyzing every move being made. Just like a chess game, they could jump in if things looked enticing. Regardless of the results, and it will take at least until 2017 for the smoke to clear, there will be winners and there will be losers, but the bottom line is that the landscape of the beer world will change dramatically. For many, the opportunity is often lost by deliberating.